Ladies can choose from diamond set wedding rings in the style of eternity rings with diamonds all around or halfway along the ring, or with diamonds set only as accents. 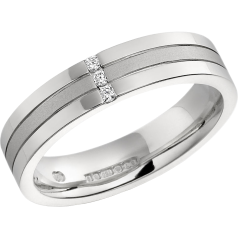 Gents have the possibility to pick from diamond set wedding rings decorated with channels and rows with different finishes. 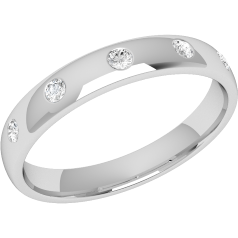 It’s possibly that the wedding ring is the first ring the groom ever wears. It’s important to select a wedding ring that is comfortable for the wearer, but it is also nice to show the importance of the event with a discreet sparkle. Our diamond set wedding rings are available in 18ct white gold, 18ct white and yellow gold, 18ct white and rose gold, platinum, and palladium. 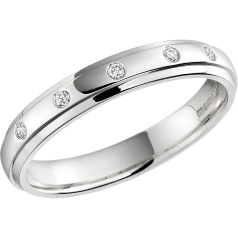 We offer wedding rings set with diamonds with round brilliant, baguette, princess and different combinations of these. We hope to offer a ring for every taste.